Quan Hy Vietnamese Restaurant is usually one of my top recommendations for non-Vietnamese who ask me where to go in Little Saigon. It's popular with Vietnamese too so you're not getting watered down fare. My only complaint about Quan Hy is that the portions are rather small for the price. Not that it's expensive, mind you. You're looking at a $7-$8 range for most dishes, compared to $5-$6 at other places. 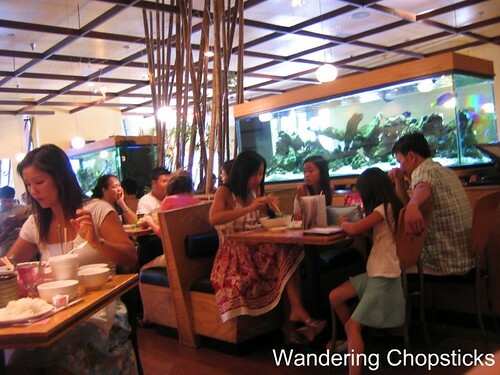 It's one of the "fancier" Vietnamese restaurants located in the "new-ish" T&K Plaza. Save room for dessert and go to Thach Che Hien Khanh located at the other end of the parking lot. There's almost always a line. 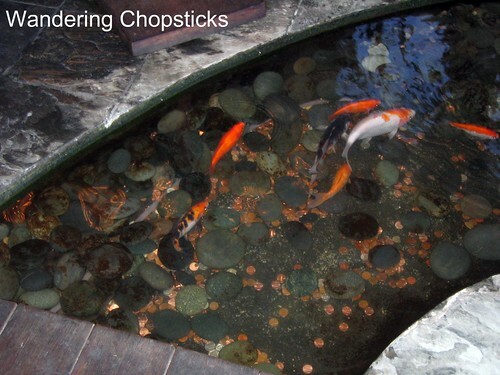 The entryway has a very shallow koi pond and bridge. Several large aquariums divide the space into two. Look for the "Nemo" fish, it's my favorite. Quan Hy specializes in Northern Central Vietnamese food, specifically food from the old imperial capital of Hue and nearby Da Nang. Hue specialities include Bun Bo Hue (Vietnamese Spicy Beef Noodle Soup from Hue), com hen (Vietnamese clam rice), and lots and lots of banh (Vietnamese dumplings). Hue is known for all the little dumplings or rather the dumplings were created in Hue because at meals the king would be offered a large variety of dishes to eat. Since he couldn't possibly eat it all, he'd sample a little bit here and there. 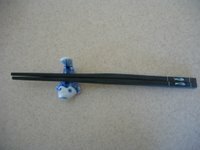 So the banhs were a way for the chefs to give the king maximum taste into one little bite. 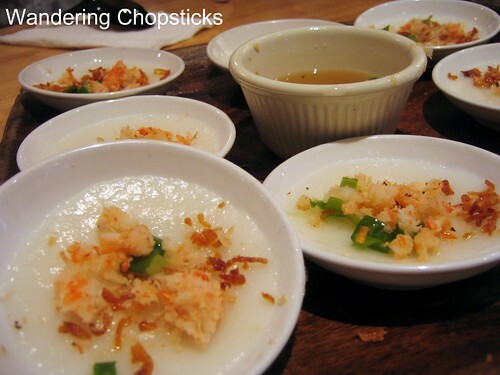 Quan Hy is known for serving banh beo (Vietnamese steamed rice discs topped with shrimp) in individual bowls. A tray of 8 is $4.75. If you're in the San Gabriel Valley, you can visit Nem Nuong Ninh Hoa or Nem Nuong Khanh Hoa for Southern Central Vietnamese food and do a comparison of banh beo. The banh beo here is freshly steamed, smooth, topped with fresh shrimp. Almost every table orders this so there's always a cup with small spoons at the ready. 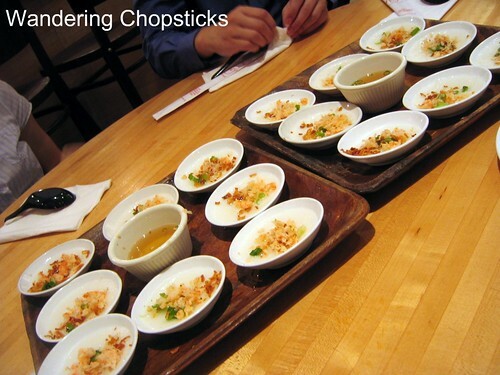 To eat, spoon a bit of the fish sauce into the individual saucer, divide in half, and scoop it out. 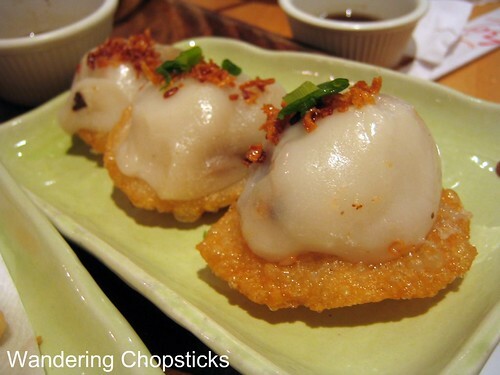 The banh it ram (Vietnamese rice flour dumplings on a fried disc) comes on a plate of 3 for $4.50. The dumplings are usually stuffed with ground pork and mushrooms. I'm used to eating banh it plain, and actually don't much care for the fried disc. The disc is made of rice flour and is crispy on the outside, chewy on the inside, too gummy in texture for my taste as it gets stuck to my teeth. 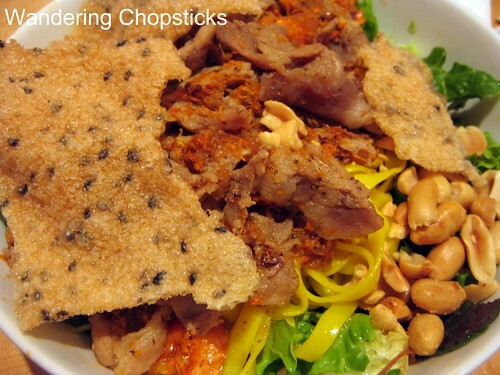 I ordered mi quang, a Da Nang specialty of tumeric noodles, pork, shrimp, peanuts, on a bed of lettuce and herbs, served with toasted sesame rice paper. Lil' sis and my dad ordered Hu Tieu (Vietnamese Clear Rice Noodles with Pork and Shrimp) on a bed of lettuce and herbs. A bowl of broth comes on the side in case you want to make the noodles "wet." The hu tieu was just the way I like it, soft, chewy. My mom ordered xoi ga (Vietnamese chicken with sticky rice). 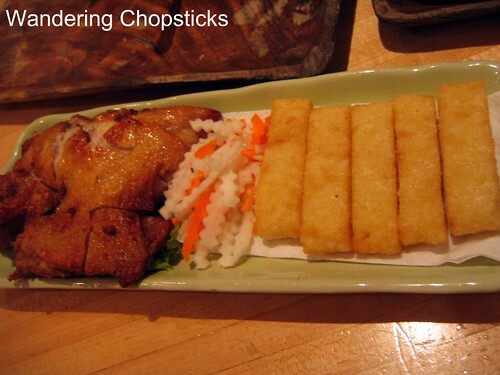 The mozzarella cheese-like sticks are actually the sticky rice, shaped into sticks and fried. It's a different presentation but quite tasty. Other foods that I've liked here but didn't order this time are the egg rolls, made with crab and wrapped in rice paper and bun mit (Vietnamese green jackfruit noodles). As I said, the portions are a bit skimpy for the price, but Quan Hy is a good introduction to Northern Central Vietnamese food, or Vietnamese food in general, for the uninitiated. There's also a vegetarian version of many of their dishes if you're so inclined. Who else ate at Quan Hy? Elmo of Monster Munching who loved Quan Hy's jackfruit salad best. ChubbyPanda said he wasn't such a fan of the sticky rice cakes but liked everything else. Dylan of Eat, Drink, & Be Merry slurps every bit of the bun bo Hue (Vietnamese beef noodle soup from Hue) broth. 1 year ago today, Fosselman's Ice Cream Co., which boasts 16% butterfat in their ice cream. wow.. that's good variety of vietnamese food there. I dont remember seeing xoi ga here in Aus.. must keep my eyes open for them. 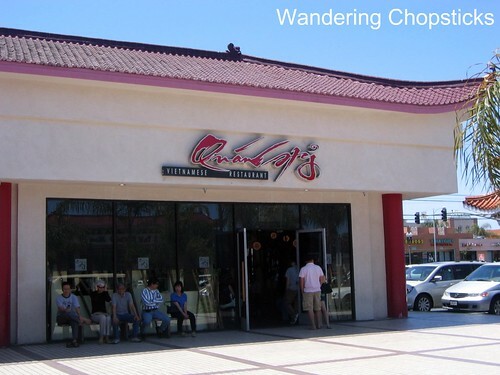 Sounds like a good eatery. You should profile some places up north in the SF Bay Area. I've never seen the sticky rice sticks anywhere else. I did profile some places in the Bay but I don't go there as often as I used to. And another one I discovered after a few trips is those beef wrapped in noodle...so good! I like the pho cuon too but rarely order it because it's so much cheaper to make at home. OMG, I LOVE THIS restaurant! Anytime I am visiting Little Saigon, I have to make it to this restaurant. Their Bun Bo Hue is the best and I love all of their little hue influenced dishes. You know, I have yet to try their bun bo Hue. I alway send up filling up on banh beo and bun mit. Oh wow, you are missing out, two of the best places that I have ever had Bun Bo Hue was there at Quan Hy and then in VN. I am not sure which location but Quan Bun Bo Hue 3a3 is what the restaurant is called in VN HCMC. Dist 1 either on Dang Tran Con or Ngo Duc Ke. Well hopefully you get to try it soon. Oh no! I hope it was just an off-day? I admit, I haven't been in a while because of the long lines. 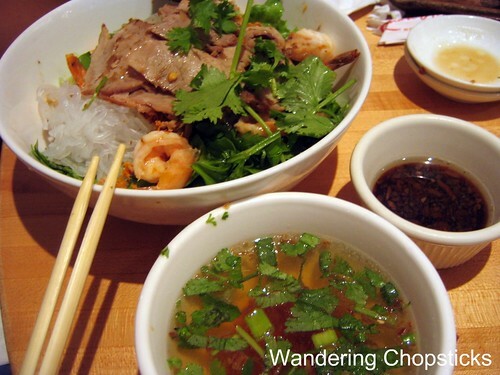 For mi quang, have you tried Quan Vy Da or Ngu Binh? The banh beo in both places isn't quite as silky, but banh it ram at Quan Vy Da and the banh bot loc at Ngu Binh are really good too. I Go Cuckoo for Cocoa!